One of the worst phrases a human being can put together is "automatic video editor." The whole thing feels like it's set up for failure. Like "vasectomy in a box" or "snooki's pregnant." Add in "for Android" and, well, let's just say I've been burned before. So it came as an unbelievable shock when I tried out Magisto, which claims to be both of these things, and it was good. I mean, really good. It doesn't offer you any control at all, but it does the job for the regular Joe or Jane in fantastic form. The process is stupid simple. 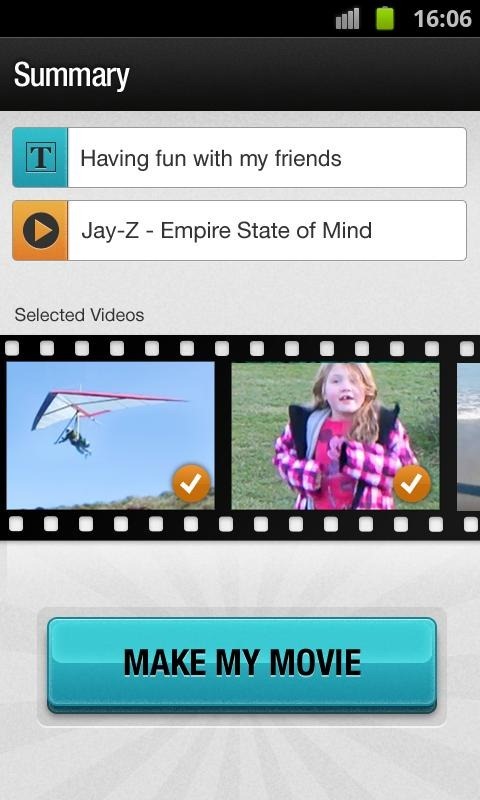 You take video with your phone's camera, then select which clips you want to include. If you want to have any kind of control over what goes in your video, this is the closest you can get. While you can choose what source material goes in to your final product, ultimately it's up to the Almighty Algorithm to decide what makes the final cut. So, improve the source material, improve the final product. That's about the best you can do. 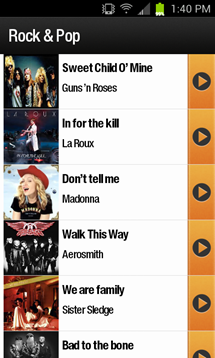 Once you've selected your clips, you're presented with a variety of music to choose from as a soundtrack. Surprisingly, the selection isn't just a bunch of synthesized free tracks. There are big names on deck: Daft Punk, Queen, Michael Jackson, Bruce Springsteen, and even more current popular music from Skrillex to Adele, and yes, even that song. While there's no accounting for taste, just about everyone's is represented here. The selection alone ought to be enough to push this over the edge. We'll get to the questions about legality in a bit, but the short version is, yes, you should be good to use these. Once you've chosen the soundtrack and clips, you enter in a title for the video and off you go. Magisto will upload your clips to its servers and then process the video. This can be a time-consuming process, so grab a snack. 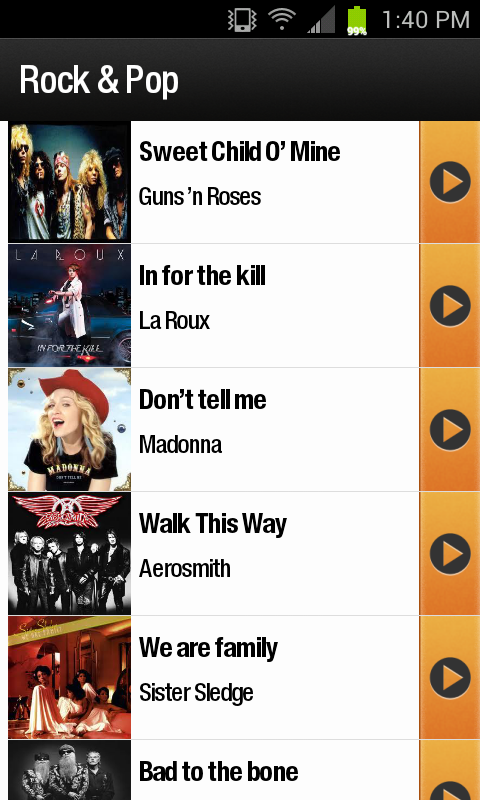 When it's done, though, depending on your song selection, the result can look pretty good. To save you the time of shooting and converting your own videos to see how yours might come out, I've taken some sample clips of my own pet turtle, Lily the Eternal. All three of the following videos were made of the exact same eight clips, totaling a little over three minutes in length. The only thing I changed was the song. The entire process of shooting, uploading, and waiting for the finished product took a little over an hour or so for all three. As you can see, the editing of the clips themselves doesn't seem to change too much, but the transitions and effects that are attached to certain songs can be wildly different. The choices of effects aren't random either. The colorful paint splashes on the Guns N' Roses song are used every time that song is chosen. Unfortunately, there's no way to see what kind of visual style you'll get to accompany your audio style, but with some rather lengthy trial-and-error, you can get to know what the various tracks end up looking like. As if there wasn't enough making me worry when I hear "automatic video editor for Android," throwing in "free music from major record labels" makes my skeptic's sense tingle something fierce. 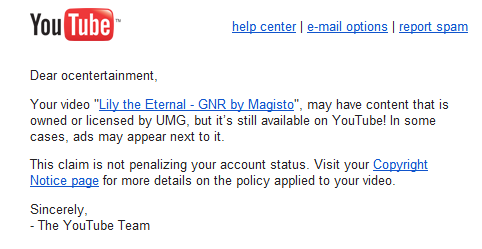 Yet, according to Magisto's website, the music in its library is licensed legally. With a few caveats, of course. You can only use it for personal use via Magisto's service and expect any kind of protection. You are allowed to upload your video to YouTube, but once you do, you're on your own. The company says they "try to ensure that videos using the music in our library will not be blocked in the U.S." but there's no implied or explicit guarantee that you won't run afoul of copyright law. Especially if you're outside the US. Almost immediately after I uploaded the above videos to YouTube, I received emails from Google stating that the music I used "may" be owned by their respective labels. However, in all three cases, the videos were still available with the warning that "ads may appear next to it." Of your ability to accompany videos with ads, Google, I have no doubt. More importantly, it says that my account status is not being penalized. However, it's impossible to say for sure that you would never run into penalties while using this service. Unfortunately, with the labels having such complex licensing schemes with YouTube, and a vague policy with no guarantees from Magisto, there's no knowing for sure just which music you could use while uploading a video to YouTube. That being said, if you're nervous about it and want to avoid any legal trouble, you can always set your videos to public on Magisto's website and share them that way. Magisto isn't going to be a go-to tool for serious content creators. We can establish that right off the bat. Including the word "automatic" in your description of a video editor removes the possibility entirely. 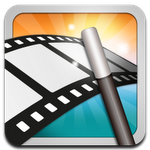 Setting aside professional needs, though, this app is the first serious contender for a legitimate video editor on Android. Even creating the relatively simple Beach Boys version of the video above (which features a musical soundtrack, simple fades, and an animated title) would be very difficult if not impossible on current Android video editing apps. For that alone, this is worth a look. At the same time, it's a bit of a sad state of affairs when the best video editor on Android doesn't even let you actually edit anything. This is more a commentary on Android apps and not Magisto, so we'll leave it at that. Suffice to say, if you want to make some cool looking videos and get a nice, licensed soundtrack while you're at it, Magisto is the way to go.